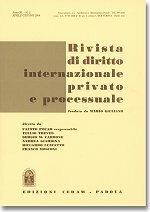 The first issue of 2015 of the Rivista di diritto internazionale privato e processuale (RDIPP, published by CEDAM) was just released. It features three articles, two comments, and three reports. Sergio M. Carbone, Professor Emeritus at the University of Genoa and Chiara E. Tuo, Associate Professor at the University of Genoa, examine the issue of third-state defendants and the revised Brussels I Regulation in “Non-EU States and Brussels I: New Rules and Some Solutions for Old Problems” (in English). The central purpose of this article is to critically assess the changes brought about by the new Brussels I Regulation as regards its scope of application vis-à-vis disputes connected with non-EU countries. Therefore, following an initial outline of the relevant amendments in the Recast, a critical evaluation of the latter against the background of both the ECJ case-law and national practice is presented. The reform is then assessed in the context of the original 2010 recast proposal presented by the EU Commission as well as of the views expressed in literature in relation thereto. The paper maintains that the Recast regime should undergo further revision with a view to implementing cross-border business transactions in the global economy and to satisfying the concomitant demand for greater certainty in international commercial litigation. Stefania Bariatti, Professor at the University of Milan, analyses the compatibility of recent Italian legislation aimed at the efficiency of the judiciary with the Brussels I and the Brussels Ia Regulations in “I nuovi criteri di competenza per le società estere e la loro incidenza sull’applicazione dei regolamenti europei n. 44/2001 e n. 1215/2012” (The New Jurisdiction Criteria for Foreign Companies and Their Impact on the Application of EU Regulations No 44/2001 and No 1215/2012; in Italian). Since 2012, the Italian legislature has adopted several statutes aimed at reducing the costs and enhancing the efficiency of the judiciary also through the reduction of the number of courts competent to hear cases where one of the parties is a company having its seat abroad. The latest version of such provisions has been adopted with Decree-Law No 145 of 2013 that centralises these cases at eleven courts. This approach has been taken by other Member States in several fields, mainly invoking the goal of increasing consistency and uniformity of judgments and the specialization of judges to the benefit of all parties. These provisions raise significant questions of compliance with the principles enshrined in the Constitution and they do not seem to attain the goal of uniformity since they provide a double track for purely internal vs cross-border cases. But they appear to be also contrary to some provisions of the Brussels Ia Regulation, in particular where the Regulation directly designates the competent court within a Member State. Hence the question of whether EU law establishes any limits to the power of the Member States to determine the territorial extension of the competence of national courts. The Court of Justice has provided some guidance on these issues in Sanders and Bradbrooke, where the protection of a maintenance creditor and of a minor were at stake. According to the Court, national legislatures should assure the effet utile of EU provisions, while at the same time ensure effective proceedings in cross-border situations, preserve the interests of the weaker party and promote the proper administration of justice. Within the “Brussels I system” such guidance may apply in cases where the position of the parties is unbalanced and the Regulation provides special fora in favour of the weaker party that are based upon proximity. Yet, one may ask whether the solution may differ according to the subject matter of the dispute. Moreover, the fact that the Italian legislature has declared that the fora established under Decree-Law No 145 of 2013 may not be derogated raises the further issue of their compatibility with Article 25 of the Brussels Ia Regulation. Alfonso-Luis Calvo Caravaca, Professor at the University Carlo III of Madrid and Javier Carrascosa González, Professor at the University of Murcia, provide an assessment of interim and provisional measures under the Brussels Ia Regulation in “Medidas provisionales y cautelares y reglamento Bruselas I-bis” (Interim and Provisional Measures and the Brussels Ia Regulation; in Spanish). This paper addresses the impact of Council Regulation No 1215/2012 on provisional and protective measures in civil and commercial matters. The paper shows that this Regulation definitively enhances the recognition and enforcement of those measures in the European Union. Provisional and protective measures attempt to reduce the risks of litigation when the debtor tries to hide or sell his assets, which is relatively easy in a globalized international society where free movement of goods and capitals is assured. Hence, Art 42(2) of Regulation No 1215/2012 provides that enforcement in a Member State of a judgment given in another Member State ordering a provisional or protective measure is possible only if the applicant provides the competent authority proof of service of the judgment ordering that provisional measure, in the case that provisional or protective measure was ordered without the defendant being summoned to appear. The new Regulation gives those measures wider possibilities of recognition and enforcement in the EU even if they were adopted inaudita parte debitoris. Francesca Capotorti, PhD candidate at the University of Milan, “La nuova direttiva sul riconoscimento delle qualifiche professionali tra liberalizzazione e trasparenza” (The New Directive on the Recognition of Professional Qualifications between Deregulation and Transparency; in Italian). This article focuses on the most innovative features of Directive 2013/55/EU amending Directive 2005/36/EC on the recognition of professional qualifications and Regulation (EU) No 1024/2012. After having outlined the path that led to the adoption of the Directive and showed the need to modernise Union law in this area, this article analyses a) the European Professional Card; b) partial access; c) professional traineeship; d) common training principles; and e) the further most important revisions of Directive 2005/36/EC aiming at promoting the free movement of professionals. This paper also addresses the novelties introduced by Directive 2013/55/EU to ensure consumer protection and to increase transparency and administrative cooperation. Finally, this article shows that in most cases the European Court of Justice anticipated the results of the new Directive. Still, a Directive is deemed as necessary to clearly and completely regulate the efforts of modernisation in this area, which hopefully will be shared by the European Commission and Member States. Petr Dobiáš, Senior fellow at the Charles University in Prague, “The New Czech Private International Law” (in English). The new Act No 91/2012 Coll. on Private International Law was adopted in the Czech Republic on 25 January 2012 and came into force on 1 January 2014. The Act on Private International Law, which takes into consideration the developments in Czech, European and international legislation, was also created with the aim of removing deficiencies and obsolete elements of legislation contained in Act No 97/1963 Coll. on Private and Procedural International Law. In terms of its internal structure, the Act on Private International Law is divided into a total of nine parts which regulate the content of private international law and procedural international law. This article presents and analyses this new legislation, taking into consideration the provisions of the relevant international conventions and secondary law of the European Union. Indeed, the new Act on Private International Law is a response to the new trends in private international law that stem as a result of the current and ongoing developments in international economic relations and in social relationships. As a result of such developments, further flexibility is asked of the domestic provisions of private international law, which must take into account the development of EU Regulations in this area of the law. As this article illustrates, the response to this demand is reflected in several of the provisions laid down in the Act on Private International Law, which emphasize the primacy of EU Regulations and international conventions. Sebastian Seeger, Assistant at the University of Heidelberg, “Restitution of Nazi-Looted Art in International Law. Some Thoughts on Marei von Saher v. Norton Simon Museum of Art at Pasadena” (in English). Georgia Koutsoukou, Research Fellow at the Max Planck Institute Luxembourg, “Report on Recent German Case-Law Relating to Private International Law in Civil and Commercial Matters” (in English). Stefanie Spancken, PhD Candidate at the University of Heidelberg, “Report on Recent German Case-Law Relating to Private International Law in Family Law Matters” (in English).